Apple's first large screen iPhone accounted for over 40 percent of the sales in its category during the three-month period ending with October, although it has been up for sale only for about a month at the end of this period. Apple launched the big screen iPhone 6 Plus and its smaller iPhone 6 companion back on September 19 with better screen, a faster processor, upgraded cameras, improved LTE and WiFi connectivity, as well as support for NFC-powered mobile payments via Apple Pay. The iPhone 6 series broke two Apple records, with 4 million pre-orders within the first 24 hours on the market and over 10 million units sold in the first three days. Research firm Kantar published a very interesting report about the iPhone 6 family and its performance on the market so far two days ago. The highlight of this report is the fact that "the iPhone 6 Plus captured 41% of “phablet” sales—sales of smartphones with a screen size of 5.5 inches and larger." Phablet sales, unfortunately, only account for 10 percent of overall smartphone sales, claims the same source. The best selling iPhone model was the iPhone 6 with about a third of the market. 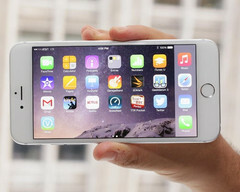 Its large sibling only managed to capture 10 percent of iOS device sales, after the iPhone 5S and iPhone 5c. We must keep in mind that these figures correspond to the period of three months ending with October and the iPhone 6 family was not on sale during the entire given time frame.